I’m very close to my mother, so I’m usually drawn to novels with strong, happy mother/daughter relationships. Carolyn Wall’s Sweeping Up Glass doesn’t fit this description, at least not the happy part. 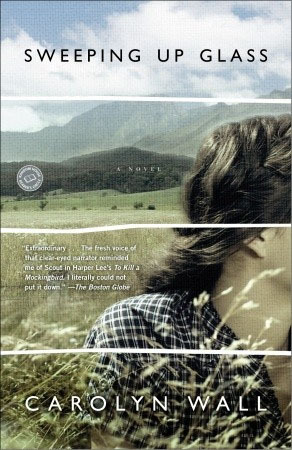 Nonetheless, this is an engaging, albeit flawed, story about family, community and racism in rural Kentucky. Narrator Olivia Harker Cross has lived in Pope County all her life. She recounts her seemingly-idyllic childhood where her best friends are Pap, her beloved father, and Love Alice, a child-bride of color. Olivia’s mother is in a mental hospital for much of Olivia’s early life. But, tranquil accounts can get boring, which is why Wall provides conflict just when things seem to be just a little too blissful. Ida, Olivia’s mother, returns home from the mental institute and life for the young girl loses much of its carefree charm. This single event slowly instigates an avalanche of challenges. Mother and daughter have a hellish relationship that continues into Olivia’s adulthood. The narrative moves from Olivia’s youth to her life as a grown woman, left to care for the mother she despises and for Will’m, the grandson she cherishes. The poverty Wall describes is tangible, as is the harsh winter weather. Less, this sound completely joyless, be assured there are moments of hope and happiness. There are also vivid images of hatred and bigotry. These play against a long-held secret that once revealed shatters everything Olivia thought she knew about herself and those she loves. The problem is that all the pieces don’t quite fit. The few missteps raise questions that trip up an otherwise compelling tale.